Seventeen-year-old Maggie was part of a fierce magical battle that ends in blackness. Thinking she'd died she ends up in the Siren's Realm. She can't go back to her previous existence, so she needs to make a life in this strange new world. The Siren grants wishes, but they come at a price Maggie doesn't want to pay. Maggie has to learn how to navigate her new surroundings, but just when she's found a new rhythm the Siren causes a storm to clear her realm from everything that is wrong. That means those without magic have to go and those with magic will keep paying. Maggie initially runs away from Bertrand. He wants to show her the possibilities of living in the Siren's Realm, but joining him would mean she has to embrace her powers. Bertrand can take Maggie on an adventure, a journey she'll never forget. Will she be brave enough to accept it? Following Bertrand will mean leaving the world she's only just entered, how will Maggie find her way back and is she ready for whatever fate has in store for them? The Girl Without Magic is a wonderful gripping story. Maggie is an intriguing main character. She's brave, talented and smart. She can be impulsive, but she's wise when she has to be. I liked that she's got strong survival instincts, they keep getting her far. She has to learn how to navigate a completely different world where she doesn't know anyone, but she doesn't despair. She makes the best of what she's been given and when a challenge presents itself she never runs away from it. That makes her an admirable person, someone I had fun reading about. Megan O'Russel has a fabulous descriptive writing style. I loved her world building skills, they captivated me straight away. She knows how to make her settings come to life and that makes her story a joy to read. I also liked the way she writes about magic. It's creative and fascinating. I enjoy it when a book is filled with unexpected twists and turns and Megan O'Russel kept me on the edge of my seat with her surprising story. I was enchanted by The Girl Without Magic from the first page and absolutely loved this thrilling adventure. 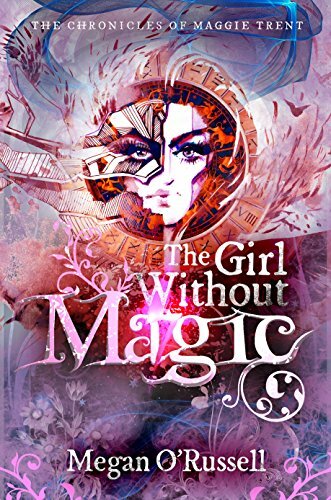 If you love magical YA you don't want to miss The Girl Without Magic. Megan O'Russell is the author of How I Magically Messed Up My Life in Four Freakin' Days and The Girl Without Magic (both with Curiosity Quills Press) as well as the YA Dystopian Girl of Glass and the Christmas romance Nuttycracker Sweet, both published with Fiery Seas Publishing. 2018 projects include Boy of Blood, the second book in the Girl of Glass trilogy (Fiery Seas Publishing). 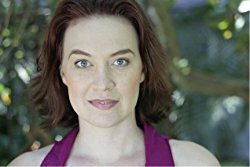 In addition to writing, Megan travels the country as a professional musical theatre performer alongside her husband, moving from show to show and stage to stage. She recently had the opportunity to add “lyricist” to her bag of tricks with Second Chances: The Thrift Shop Musical. I’m in love with travel. Whether it’s finding a new trail to hike near home or taking off on an epic adventure to Thailand, I’m always plotting the next adventure. And my journeys have shaped my writing in many ways. There’s an amazing lake in Thailand called Khao Sok Lake. The lake is massive, filled with stone pillars and islands, and it twists in so many directions only certain people are allowed to captain boats on the water. If a normal person were to take out a boat, they would get lost on the lake and no one would find them. I was lucky enough to be able to spend the night in a floating hut on that lake. It was some time around sunset, when the spires of the lake were consumed by shadows, that I knew I wanted to use the lake in a book. It took me a little time to figure out what story the lake should be a part of, but when I began working on The Girl Without Magic, I couldn’t think of a better place to set the bulk of the action. There was something innately magical about watching the mist rise off the water in the morning, and hearing the monkeys rustling in the trees high above. And I wanted to bring my readers into that world. With my own dash of magic and danger added to the mix, of course. Less exotic locations have worked their way into my books as well. Bryant Park in New York City plays a large part in How I Magically Messed Up My Life in Four Freakin’ Days. The mountains of Upstate New York ended up in The Tethering Series. I don’t know how many botanical gardens and biodomes I visited to build the world in Girl of Glass. My love for integrating isn’t purely because smelling a real place makes it so much easier to draw your readers into an imaginary world. I know that I am more privileged than most in the travel opportunities I have been provided. As a writer, I have become the travel agent to the teenager who reads my book in the library. I can lead my young reader who has never left the city limits of their home town to the streets of Manhattan. Sure, there’s magic mixed in with regular life in NYC, but the characters are still living in the city, stinky subway cars and all. There are more corners of the world than even the best traveled could manage to visit in a lifetime. I read to travel just a little bit further than my life will allow. I write to bring others on the journey along with me. One very lucky reader of With Love for Books will receive a digital copy of The Girl Without Magic by Megan O'Russell. I love the artwork on the cover, it's beautiful. The Girl Without Magic sounds like an exciting tale with magic, action, discovering new worlds and tons of adventure. Sounds a great read. :) A magical tour of adventures and action all set in new worlds. Without magic but sounds magical read with teleporting power to another realm. Thank you for review and giveaway. Good luck with your books. Gosh, imagine waking up and finding yourself in a completely different world!